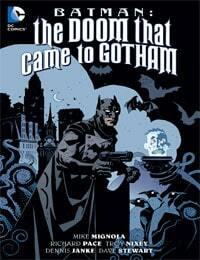 Batman: The Doom That Came to Gotham Average 0.00/5 - out of 0 total votes. An unholy union of a comic book icon and pure Lovecraftian horror is unleashed by writers MIKE MIGNOLA, acclaimed creator of Hellboy, RICHARD PACE (Robert E. Howard's Savage Sword) and artist TROY NIXEY (HARLEY QUINN) in this terrifying reimagining of the greatest heroes and villains in the Batman mythos. It's Gotham City, 1928. Twenty years have passed since a madman slew the parents of young Bruce Wayne, heir to one of the city's oldest fortunes. Twenty years since he fled the carnage of Gotham. But now Bruce Wayne has returned-and hell has followed. A terrible thing from beyond space and time has awakened. The Lurker on the Threshold has called its faithful servants-immortal sorcerers, reptile men, beings of eldritch cold and fungal horror-to feed our world into its gaping maw. If the Batman hopes to end the horror, how terrible must Bruce Wayne become?